Select full or partial screen to be recorded (Full screen-Rectangle screen). Select the target automatically when you click 'Find window'. 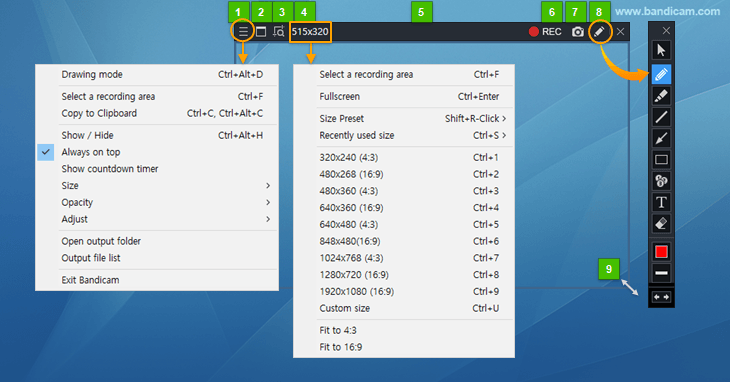 Select a predefined size of partial screen to be recorded. Move the rectangle screen recording window. Add arrows, boxes, text, numbers or highlights. Scale up or down the size of the rectangle on a screen. Users can simultaneously add arrows, boxes, text, numbers or highlights while recording. To hide the screen recording window, click the "Show / Hide" menu or use the "Around mouse" recording mode. Even if you hide the screen recording window, you can always check the recording status by setting the Bandicam icon to appear on the taskbar.